Farm workers in Mozambique carrying harvested maize back to their village for processing. 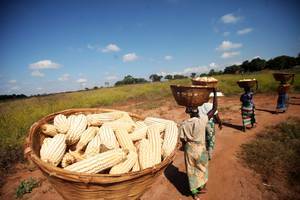 Rome, 19 December 2014 ­ – Cereal-based farming systems must join the transition to sustainable agriculture if they are to meet unprecedented demand for maize, rice and wheat. That was one of the key messages to emerge from a meeting held by FAO this week and attended by leading crop production specialists. FAO estimates that over the next 35 years farmers will need to increase the annual production of maize, rice and wheat to 3 billion tonnes, or half a billion tonnes more than 2013’s record combined harvests. They will need to do that with less water, fossil fuel and agrochemicals, on farmland that has been widely degraded by decades of intensive crop production, and in the face of droughts, new pest and disease threats, and extreme weather events provoked by climate change. Experts at the meeting said that that challenge could only be met with eco-friendly agriculture that achieves higher productivity while conserving natural resources, adapting to climate change, and delivering economic benefits to the world’s 500 million small-scale family farms. The meeting focused on maize, rice and wheat because those three crops are fundamental to world food security, providing 50 percent of humanity’s dietary energy supply. Cereals are also increasingly vulnerable: climate trends since 1980 have reduced the annual global maize harvest by an estimated 23 million tonnes and the wheat harvest by 33 million tonnes. Green Revolution cereal yield increases, once averaging a spectacular 3 percent a year, have fallen to around 1 percent since 2000. In Asia, the degradation of soils and the buildup of toxins in intensive paddy systems have raised concerns that the slowdown in yield growth reflects a deteriorating crop-growing environment. The FAO meeting agreed that agriculture can no longer rely on input-intensive agriculture to increase crop production. Improved varieties of maize, rice and wheat must go hand-in-hand with what FAO calls “Save and Grow” farming systems that keep soil healthy, integrate crop, tree and animal production, use water far more efficiently, and protect crops with integrated pest management. The elimination of soil tillage on wheat land in central Morocco cut water runoff volume by 30 percent and sediment loss by 70 percent, leading to increased water holding capacity that boosts crop productivity in drier seasons. In Zimbabwe, conservation agriculture has helped smallholder farmers produce up to eight times more maize per hectare than the national average. Farmers in Zambia grow an acacia tree, Faidherbia albida, near maize fields and use its nitrogen-rich leaves as natural fertilizer and a protective mulch during the rainy season, resulting in a threefold increase in yields. The challenge facing policymakers is to accelerate the adoption of “Save and Grow” farming systems. One clear need flagged by the meeting was greater support to smallholder farmers in adapting ecosystem-based farming practices to local conditions, which will require the revision of national policies, considerable upgrading of extension services and approaches that reduce the transaction costs of knowledge sharing, such as farmers’ field schools. The FAO forum was attended by 50 crop production specialists from AfricaRice, CIMMYT, FAO, ICARDA, IWMI, IRRI, and agricultural development institutions in Asia and Latin America. Their findings will be presented in a policymakers’guide, Save and Grow: Maize, rice and wheat to be published in 2015.